Discussion in 'Asus UK' started by Splooshiba, 11 Jul 2017. I was hoping to have the cards RGB lighting lit up white, however it is actually very pink looking in person. I understand how RGB works and that it can't always recreate perfect white, however I have had decent results with other RGB products by tuning the lighting output. For example if "white" is pink, turn down the red slightly or turn up green and blue to get a closer approximation of white (e.g. 245,255,255). I don't think I am able to do this with Aura. 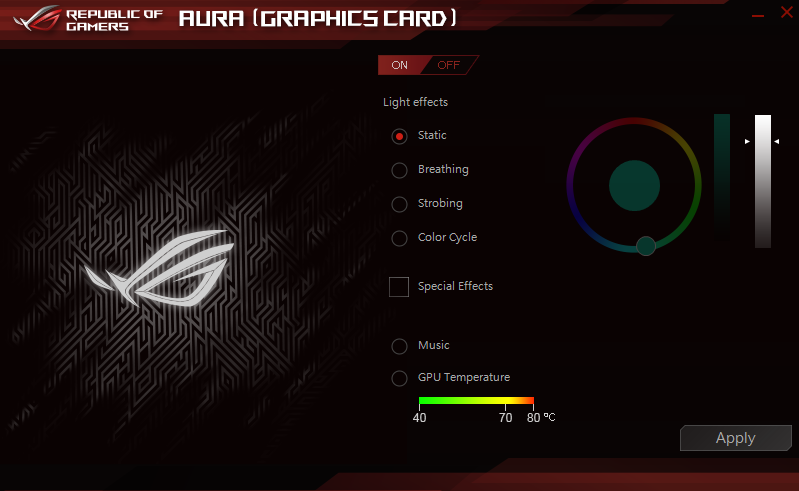 The Aura website (https://www.asus.com/campaign/aura/us/Sync.html) has a preview feature with a control panel like this, which (I think) allows for full RGB control. To reduce red/pink, pick turquoise and select nearly entirely white. This allows me to select a colour and then select a brightness OR select the white bar and select a brightness. Importantly I can't pick an only ever so slightly turquoise colour here, its either bright turquoise or dim turquoise, but not nearly white turquoise. 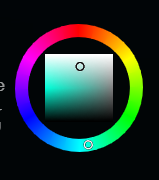 This means that I can't tune my white colour to a closer approximation of white. I was wondering if there is any alternative Aura software with the alternative colour selector (I have tried old versions and none have it), or if there is some alternative software? 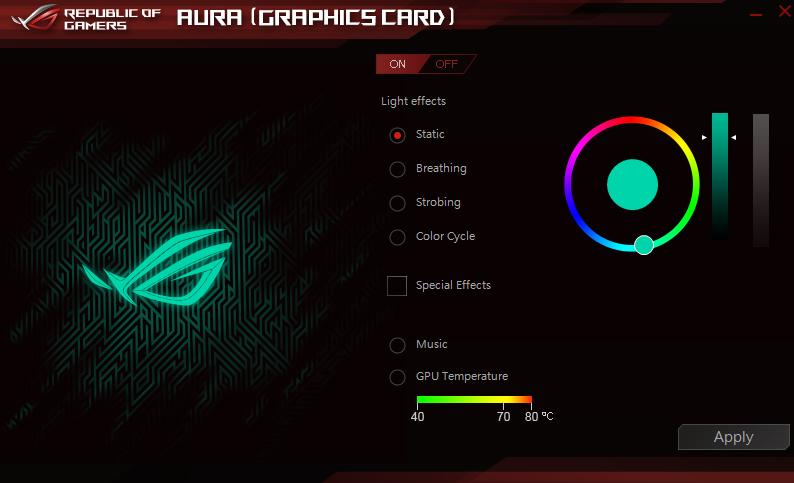 A debug tool with the ability to enter an RGB code would be perfect. I think that other software is for their motherboards possibly? I think you are right there, I was hoping there would be some work around or old software version with a simple RGB value input. I don’t think that they even frequent this forum anymore.